I define myself as a “protein biochemist”. But, when I am asked to define our research area, I get into trouble. I generally give an answer like this: “We study structure-function mechanisms of bacterial pore-forming protein toxins”, which is probably a very-very specific research topic in the field of biological sciences. When I was asked to write about our journey in interdisciplinary science, I was not very sure about what to write. But then I realized that addressing most, if not all, of the problems of biology these days requires some sort of interdisciplinary approach, depending on how we define interdisciplinarity. In terms of my independent research career, I am about to complete ten years in March 2019. Therefore, this is an interesting opportunity for me to look back at our journey so far, and it will allow me to consolidate my thoughts regarding our future directions. So, let me go back a few years. 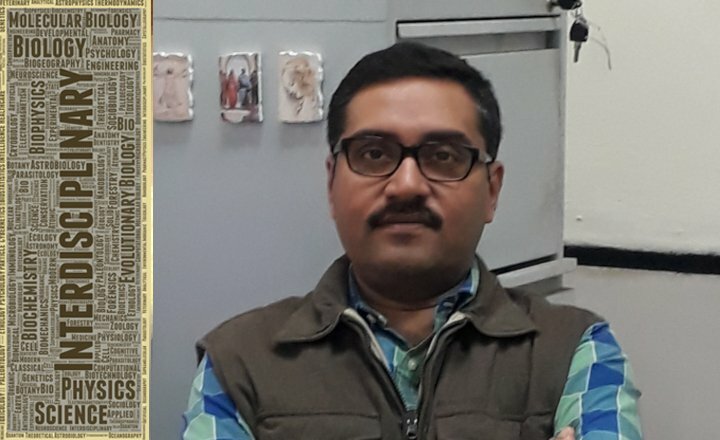 After completing five and half years of post-doctoral research experience at the Albert Einstein College of Medicine in New York, USA, I joined the Indian Institute of Science Education and Research (IISER) Mohali as an assistant professor of biology in 2009. It was a fascinating experience to start the PI job, more so to start everything from scratch, particularly since the institute itself was still at its infancy at that time. As it is probably true for many new PIs, the main challenge for me was to pick and establish the theme of my lab’s research – a theme that would allow me to get grants, attract and motivate PhD students and/or post-docs to join my lab, fetch us quality publications, and would not go out-of-fashion over the coming years. I considered taking up a research problem that we could start pursuing immediately with the basic infrastructure available with us, with the potential to expand its dimension as more advanced infrastructure would develop. And thus, our journey into the fascinating world of bacterial pore-forming toxins (PFTs) began. 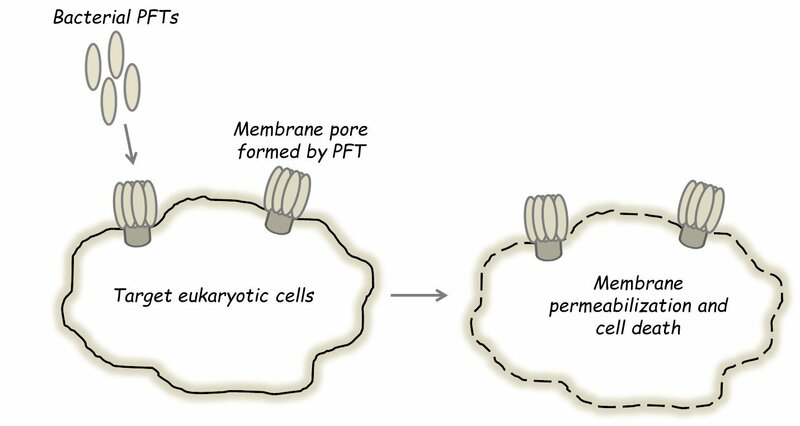 Mechanisms of the membrane pore-formation processes employed by the PFTs offer many unsolved questions in the context of protein structure-function paradigm, and connect to some of the most intriguing issues that are relevant to the structure, folding and function of membrane proteins. Being potent virulence factors of bacterial pathogens, PFTs also serve as important targets to study in the context of bacterial pathogenesis and host-pathogen interaction processes. It requires an interdisciplinary approach involving the tools and methodologies of biochemistry, biophysics, structural biology, as well as cell biology and immunology to achieve an in-depth understanding of the mode of actions of bacterial PFTs. We started our journey in the field of PFT-biology by exploring some of the basic mechanistic issues that we could address by employing mostly biochemical and biophysical approaches. However, over the years we made attempts to venture into new areas, particularly exploring the consequences of the PFT functionalities in the context of host-pathogen interaction processes and host immunity. For example, in the earlier years, we had mostly used the tools of protein and membrane biochemistry/biophysics to elucidate the physicochemical properties of the PFTs, to study how they interact with target membranes, and to understand mechanistic details of the oligomeric pore-formation processes in the membrane lipid bilayer environment. Now, in recent years, we have also started looking at how PFTs can trigger diverse cellular responses in the host eukaryotic cells. In particular, we are trying to explore whether and how the cells of the innate immune system, as the first responders, can mount any response against PFT-mediated attacks. For this, we have tried to develop new expertise within the lab, and have also established collaborative efforts. I must say here that our journey so far would not have been possible at all without the hard work, and passionate involvement of all the past and present lab members. I did my B.Sc. in Chemistry, followed by M.Sc. in Biochemistry. Subsequently, I pursued my PhD and post-doc research career in the field of biochemistry and structural biology in the broader context of microbiology and immunology. Obviously, due to my academic and research background, I developed an inclination toward addressing problems with biochemical, biophysical, and structural approaches, with a strong impetus to understand their cellular and organismal implications. Therefore, I seek constant discussions, and collaborative interactions, if needed, with cell biologists, neurobiologists, immunologists, and computational biologists to address these problems from a broader perspective. Any biological question can be queried from different angles. What we see in nature has evolved over millions of years and any biological function is regulated at multiple organisational levels: from genetic to cellular to organismal and finally ecological. Each level is highly complex and usually studied by a specific group of experts, such as geneticists, molecular biologists, biochemists, cell biologists to ecologists and evolutionary biologists. With tremendous advancement in each of these areas, specialization has taken deep roots in academia. However to get a complete picture, one needs to study it using multidisciplinary approaches. This requires two very important settings: (1) a broad academic background, and (2) a niche conducive to performing such interdisciplinary studies. I had acquired some breadth in my approach to biological problems, but I am lucky to have found a suitable academic setting at IISER Mohali. Here, constant interactions with the faculty colleagues, who are cell biologists, neurobiologists, immunologists, computational biologists or evolutionary biologists, allow me to think about other exciting possibilities that could be ventured in the context of our studies on PFT-biology. In my opinion, the need for doing interdisciplinary science depends purely on the particular research problem. It cannot be imposed forcefully. But, what is important is to appreciate and explore the possibilities, if the need arises. And, for that, you need to be in a place where such possibilities can be ventured upon. Once again, for this I consider myself to be fortunate enough to be at a place like IISER Mohali. 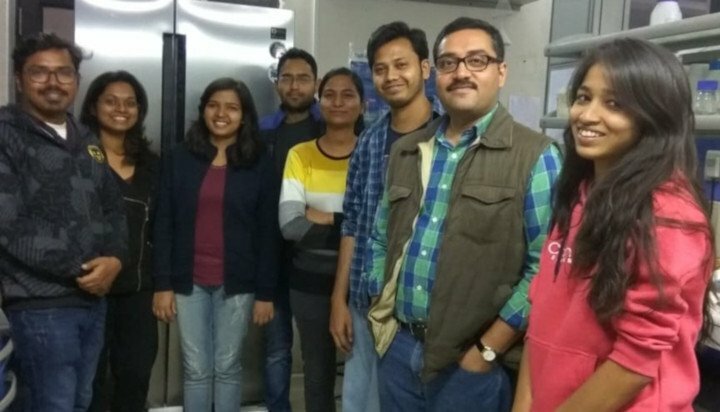 At IISER Mohali, I am surrounded by faculty colleagues who are not only biologists, but are from all the disciplines of basic sciences, as well as from the field of humanities and social sciences. Even within our department of biological sciences, we have enormous diversity in terms of themes of the research fields and expertise among the faculty colleagues. Such an environment, along with an ambience of scientific and academic freedom, provides ample opportunity to build up collaborative efforts, whenever your research demands it. Apart from the direct opportunity of collaborative research, such an interdisciplinary environment encourages to at least think about the research possibilities beyond your expertise and comfort zone. Indeed, this has been true in my case. I would rather say here that my own inhibition to go beyond my comfort zone was possibly the main challenge to use interdisciplinary approaches. One can always say that more funding would have been helpful, but I guess an experimental biologist can never possibly be satisfied with the available fund support, anyway. I would also like to mention another very important aspect that I enjoy while being at IISER Mohali. We are all actively engaged in teaching here. I personally feel that teaching, particularly to the fresh undergraduate students who are coming to our program straight from the schools, gives me a different kind of flavour and satisfaction. They ask lots of questions. Many times, I do not know the answers, sometimes the answers are not yet known. But, in an attempt to meet their queries, I am forced to go back and read textbooks and literature to study the topics that are way beyond my area of research. I consider that there is another plus point of being actively engaged in teaching. My research activities may not, and will not go equally well all the time. Inevitably, there are phases when the research progress and output face challenges and blockades. During those times, teaching activities can be really satisfying as well as relaxing. So, altogether, it has been an exciting journey so far for me, and I can only hope that it gets more exciting in the coming years. Did you enjoy this article? Let us know in the comments below.